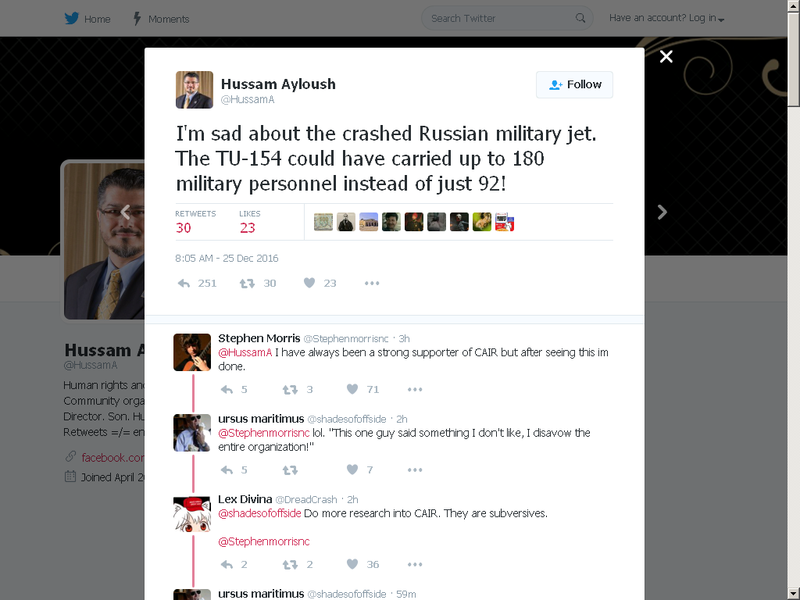 “I’m sad about the crashed Russian military jet,” Ayloush tweeted, before pivoting to a dark, twisted joke wishing the plane had more people on it. “The TU-154 could have carried up to 180 military personnel instead of just 92,” he happily declared. Amazingly enough, the Democrat fancies himself “a lifelong human rights activist,” though, just not civilian citizens of Russia apparently. Ayloush has a history of controversial statements (controversial by average American standards, but pretty much the norm for Democrats). He appeared on CNN shortly after the terrorist attacks in San Bernardino and blamed the United States for the carnage. “Let’s not forget that some of our own foreign policy, as Americans, as the West, have fueled that extremism,” he accused. Immediately following Donald Trump’s victory in the election, the charming Democrat called for an overthrow of American government … in Arabic. A real gem of a human being – which is probably why his risen in the Democrat ranks in uber-liberal California.